The most well-known and spectacular (or some might say highly speculative) instance of a blockchain distributed ledger technology (DLT) is bitcoin, the cryptocurrency platform. Yet when one takes a broader view of this emerging technology, supply chain applications could be even more spectacular and greatly influence global commerce. Is this just more speculation? Consider recent shipper survey data: The top three value creation opportunities from digitization cited by respondents (Figure 1) – visibility, analytics, and trading partner integration – can and will be dramatically improved with DLTs, in our view. And DLTs can also create value in other areas across the supply chain. Source: SCDigest Supply Chain Digitization Benchmark Survey 2016, SCDigest & JDA Software. In this Brief, we will provide a non-technical overview of blockchain and DLT and then outline how these technologies can potentially be used to address supply chain value creation opportunities. Finally, we note that blockchains are still an emerging technology, with many technical, standards and regulatory hurdles still to be addressed. As with other technology innovations, there will be those industry players who will benefit, while those who do not adapt will suffer. Blockchains are digital sets of transactions that are linked together sequentially over time. Rather than linking one transaction at a time, multiple transactions are bundled into what is referred to as a “block.” For example, in the bitcoin implementation of blockchain (where it all began), a block of transactions, in this case, transfers of bitcoins from one party to another, is added every ten minutes or so, by design. As a matter of historical curiosity, Figure 2 depicts the very first “genesis” block created in the bitcoin blockchain on January 3, 2009 by an unknown person. 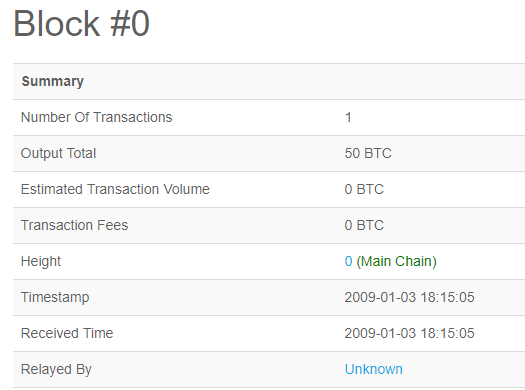 As of this posting, there are now a total of 509,466 blocks in the bitcoin chain. The blockchain computer code powering bitcoin, as well as other blockchain instances, is open source and available for other applications beyond just cryptocurrencies. Indeed, headline news about bitcoin’s spectacular price rise is accelerating research and investments in blockchains and DLTs for other uses in many sectors, public and private. Blockchain DLTs, like traditional ledgers, keep track of various assets. These might be bitcoins, traditional currencies, or other things such as shipping containers, serialized diamonds, or real estate. It is distributed in that a complete copy of the ledger is maintained by each party, in a peer-to-peer network. So, unlike traditional databases that are centrally maintained, say in a corporate data warehouse or in the Cloud, blockchains are duplicated and maintained decentrally. Hence, no single entity owns the data or is required as an intermediary to process, store or verify transactions or data integrity. To ensure all parties have an exact copy of the same data and agree on its contents (i.e., the blocks of transactions linked in a chain), a consensus algorithm is deployed. Without diving into the technical details, the consensus algorithm ensures that only one true version of the state of the ledger is maintained and agreed to by all. And once established, the blocks are immutable; that is, they cannot be changed. In so doing, the consensus algorithm enforces trust among even unknown parties and prevents corruption by potentially malicious participants. In the bitcoin distributed ledger, consensus is achieved and new blocks are added through a “proof of work” algorithm, better known as “mining.” The proof-of-work mining requires a substantial amount of computing power (and electricity), but rewards the miners with a small bitcoin payout upon successful completion of the consensus algorithm, which is at its core a challenging mathematical problem. Another important feature of blockchain DLTs is the “smart contract.” Smart contracts are computer programs embedded in the DLT which automatically execute upon certain conditions. These smart contracts are what makes DLTs potentially more valuable in commercial applications than a simple transfer of an asset between participants, and they open up many possible applications. Blockchains can be “permission-less” or open to the public, like bitcoin’s implementation, where anyone can join and remain anonymous by design. Other blockchain platforms, such as the Linux Foundation’s Hyperledger and Enterprise Ethereum Alliance’s Ethereum, can operate publicly or also as “permissioned” or private blockchains. In permissioned blockchains, the participants are known entities invited to participate and secured against access or visibility by non-participants. In the case of private blockchains, faster and less computationally/less-energy-intensive consensus algorithms can be selected, as compared to bitcoin’s. Smart contracts execute pre-defined actions when certain conditions exist. In this way, blockchains serve both as a trusted transaction record and an autonomous transaction processor, all consensus algorithm driven and tamper proof. Maersk: Cargo tracking pilot, linking farmers, freight forwarders, land-based transporters, customs brokers, governments, ports, and carriers for a shipment of flowers from the Kenyan port of Mombasa to Rotterdam. The company recently announced a joint venture with IBM to develop blockchain-based global trade solutions. MTI: This freight forwarder (Marine Transport International) piloted blockchain-based connectivity between supplier, shipper, load point, customs, and terminal. BiTA: Blockchain in Trucking Alliance is an industry consortium seeking to build blockchain standards for trucking use cases, e.g., payments, communications, proof of delivery, proof of provenance, and self-executing smart load contracts. US CBP1: Proposed 14 use cases spanning licenses, permits, certificate of origin reporting and free trade agreement, product qualifications, carnets, and bonded movement tracking. To be sure, these pilots are initial steps toward defining, piloting, and rolling out more powerful supply chain applications. But they demonstrate the potential of blockchain-based shared and tamper-proof data, peer-to-peer transacting, elimination of third-party intermediaries, permissioned private blockchains, and simple smart contracts. Like the early days of the Internet, predicting today where blockchain and subsequent DLT technologies will ultimately go is possibly as speculative as predicting where bitcoin’s price is headed – there will be the Webvan failures and Amazon successes (which ultimately absorbed what was left of Webvan). Secure public and private communications, providing peer-to-peer, trusted, immutable, tamper-proof, and ultimately lower cost transactions between trading partners, auditors, governments, financial institutions, and others replacing EDI and other forms of internet communication protocols. Expanded supply chain visibility, with a mix of public and private accessibility, intelligent alerting, coupled with smart contract-based transaction processing. New generation of supply chain analytics, with the ability to crawl through multiple blockchains accessing inventory, locations, bills of material, product characteristics, things (e.g., shipping containers or your refrigerator), and the list goes on, optimizing decisions, assessing risks, and identifying new opportunities. Undoubtedly, artificial intelligence developments will play large here. Smart contract-based business models, enabled by further technical developments for smart contracts to intelligently manage more complicated transactions and interact with other smart contracts across multiple private and public blockchains. The peer-to-peer nature of blockchains and smart contracting technologies have led some industry observers to conclude that supply chain intermediaries such as freight and customs brokers and other third-party logistics (3PL) providers will be left behind. Why would a broker be needed when trading partners or shippers, carriers, governmental customs agencies, and financial companies (or who needs even financial intermediaries, with bitcoin?) directly transact via blockchains and smart contracts? Brokers and 3PLs will need to adapt or adopt these new technologies as they have done over the years with successive generations of technological advancements, from EDI to the Internet. Those companies with low-value added business models that can easily be replaced with a blockchain and smart contracts are at the highest risk and will suffer or disappear. On the other hand, 3PLs that create unique value through their understanding of their customers’ logistics needs and are able to configure solutions to match, while incorporating DLTs into their business models, will thrive. Furthermore, as described in the next section, blockchains have limitations and are not well suited for all supply chain use cases. So 3PLs and brokers will not be eliminated entirely anytime soon. Transaction processing speed and data management limitations – it’s just not efficient to store large quantities of data duplicated on a peer-to-peer network. For private business-to-business blockchain, a hybrid model of centralized and DLT-based data structures may be most efficient. Data integrity is weakest at the “endpoints;” that is, where people, IoT devices, or other computers input information into the transaction block. For example, a bad actor, or maybe a malfunctioning or even a hacked electronic thermometer could input incorrect data into the blockchain record, disastrous in a cold chain application. Trusted third parties have a role to play in ensuring data integrity. Security of such data even in a private blockchain implementation is a work in progress, particularly with smart contract-driven transactions. Furthermore, because access to blockchains depend on users’ public and private encryption keys, hacking vulnerability also lies in the systems that store such keys. Smart contracts, while holding great promise, are still quite basic. And if the business rules between trading partners change frequently, today’s smart contracts are just not smart enough to accommodate more fluid business relationships. Standards and regulations will need to be proposed, debated, revised, and adopted. Importantly, the legal system needs to sort out rules and protocols for smart contracts. Regulators will need to weigh in as to what can be held truly confidential – of particular interest when a supply chain process triggers a financial transaction. Despite these caveats, we expect substantially increased blockchain investments and developments in 2018 and beyond, and the emergence of new 3PL competitors seeking to create value across the supply chain with DLT-based solutions. 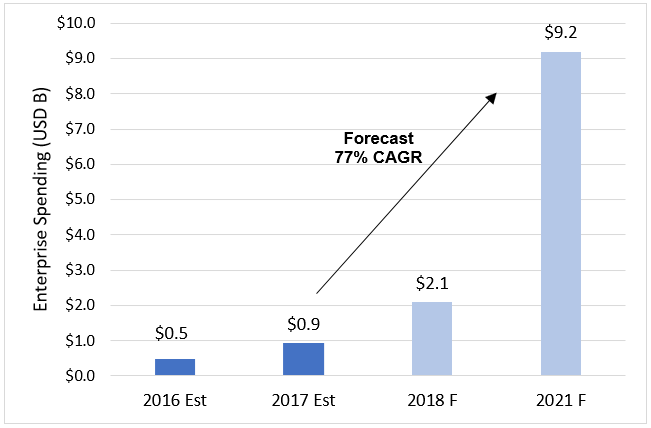 Worldwide spending on blockchain solutions is expected to reach $2.1 billion in 2018, up from $945 million in the prior year (Figure 3). Supply chain and global trade solutions are the leading use cases, at about 30% of the 2018 spend, and are expected to remain the largest in 2021. Collaborate with your customers and business partners. What are they thinking? How might blockchains improve your mutual businesses? Consider sponsoring workshops, research projects, and pilots. Add and develop your talent. Logistics and supply chain talent with technical know-how has always been in high demand and short supply. The good news is that blockchain and DLT educational resources are expanding, including university curricula, executive programs, online courses, and community meetups. Join or create an industry group. Blockchain development/standards consortiums are forming in many industries and academic, professional, and governmental organizations are establishing blockchain working groups. These are great ways to learn about and influence development. Stay informed. The technology is progressing rapidly, as are supply chain use cases. 2018 will be an exciting year to learn more and consider piloting a few use cases with your trading partners. Blockchains have the potential to transform supply chain management and dramatically impact how global commerce is conducted. Supply chain players and logistics providers are urged to get started. Yet, as was the case with the Internet, a clear path forward may still be years away. Dave Frentzel is a Partner at New Harbor Consultants. Dave brings 30 years of management consulting and hands-on executive leadership experience to improve business outcomes. Prior to joining New Harbor, he held various senior positions at 3PL and supply chain technology companies. Dave has extensive global management expertise having spent more than ten years living and working internationally helping companies with their global go-to-market, organizational, sourcing, manufacturing and supply chain strategies and operations.